Recently, Volvo’s new XC90 won the North American Truck of the Year award, which is a truly important accolade. Unlike other automotive awards, the North American Car and Truck of the Year awards are determined by an independent panel of automotive journalists instead of a single publication. This means that the XC90 can really be considered the best truck of 2016. Or can it? Is the Volvo XC90 really a truck? When you compare an XC90 to pickup trucks like the Chevy Silverado or Ford F-150, there is, at least at face value, a stark difference between the two. So, what makes a truck a truck? A truck is defined as an automobile that’s designed to carry cargo. The XC90 clearly meets this requirement, with almost 85.7 square feet of room once the rear seats are down. This is definitely enough space for the XC90 to carry a wide variety of cargo. Unfortunately, that definition still doesn’t make a truck a truck. You could put a brick in the trunk of a sedan, but that wouldn’t make the sedan a truck. So how else can you define a truck? Most pickup trucks and large SUVs have a “body-on-frame” construction, with the backbone of the truck consisting of what is widely known as a ladder frame. A ladder frame is essentially two parallel bars with perpendicular crossmembers connecting the two bars. The body of the truck rests on the frame, and the frame takes the majority of the forces exerted during heavy use, like towing or hauling. 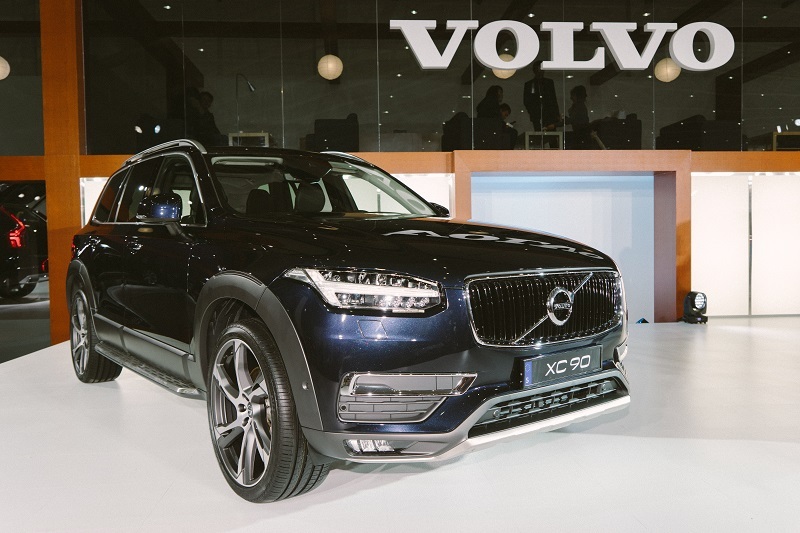 The new Volvo XC90, on the other hand, has a unibody construction. Some might claim that this would disqualify the XC90 from the truck category, but then again, the Honda Ridgeline pickup truck also has a unibody construction. Furthermore, in the not-so-distant past, the ladder frame was just as prevalent in cars as in trucks. The primary reason for the switch to unibody construction in cars was that it allowed for weight savings and increased chassis rigidity, making cars handle better and be more efficient. A unibody design also allows for a better use of interior space, allowing vehicles like the XC90 to carry more cargo internally. Trucks have more or less maintained that ladder frame for towing purposes, but the XC90 is able to tow 4,000 lbs, which is plenty for light-duty trailers and boat hauling. The XC90 may not have a ladder frame, or a pick-up bed, or a large-displacement engine, but it still can eagerly perform many of the duties that most people ask of a pickup truck. Also helping the XC90’s case is that the government doesn’t actually distinguish between light trucks like the Ford F-Series, Chevy Silverado, or Dodge Ram and a small car like the Honda Fit. Legally, those trucks are actually just cars, and practically, they’re still just cars. A large swath of pickup truck owners rarely use their trucks for towing or hauling, but just as daily drivers that can be useful when you have to move. Most trucks these days live cushy lives, powered by the finest gas and fretted over by their owners when door dings and scratches inevitably occur. Therefore, at the end of the day, what makes a truck a truck comes down to how you use it. With that in mind, truck on, Volvo.